CytoZyme Stabilized Pepsin is a liquid formulation of purified pepsin with enhanced shelf life used for preparing tissue samples for FISH assays. 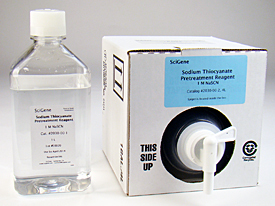 Provided as a concentrate ready for dilution in CytoZyme Reaction Buffer, the activity of each lot is assayed to ensure consistent lot-to-lot activity eliminating the need for laboratories to evaluate new lots. Priced over 80% less than Abbott Kits, it significantly reduces FISH cost per test. CytoZyme is available in high (HC) and standard activity formulations. CytoZyme HC is a high potency solution used for digesting any tissue by diluting the working solution to match the tissue type; eliminating the inconvenience and added cost of purchasing different reagent kits. Standard activity CytoZyme is also available with an activity equivalent to Abbott Pretreatment Kit I.
CytoZyme Stabilized Pepsin, 5 ml. CytoZyme Stabilized Pepsin, 20 ml. CytoZyme Stabilized Pepsin, 100 ml. CytoZyme Reaction Buffer, 250 ml. CytoZyme HC Stabilized Pepsin, 5 ml. High Concentrate. CytoZyme HC Stabilized Pepsin, 20 ml. High Concentrate. CytoZyme HC Stabilized Pepsin, 100 ml. High Concentrate.